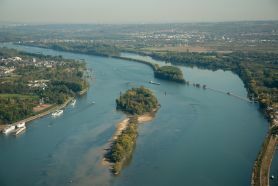 With the RheinMainCard, you can avail of attractive discounts at over 40 recreational and cultural establishments, zoos, swimming pools, thermal baths, museums, sports facilities and restaurants – while enjoying free and unlimited travel on the services of the Rhine-Main Transport Association (RMV) throughout the entire RMV area. 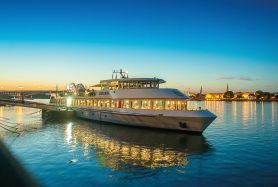 Apart from tickets for scheduled trips on the Rhine with KD Schifffahrt, the Tourist Service Center now also sells tickets for great all-inclusive evening river cruises with a DJ. Enjoy great entertainment on the river with friends and family. Book now at the Tourist Service Center, by phone (+49 6131 242888) or by e-mail (tourist(at)mainzplus.com). Enjoy preparing and eating the food of Rheinhessen in a lovely historic building with a state-of-the art kitchen. The courses are also available for small groups of minimum 8 people. You learn how to prepare local tapas, using traditional ingredients of Rheinhessen: Handkäs as a mousse with walnut crocant served with a radish salsa, or buttery Handkäs tartar are just two suggestions – as you will soon come up with your own creations. Wine and savoir-vivre are at the main ingredients of social life in Mainz and Rheinhessen. The area is part of the global Great Wine Capital network that also includes Christchurch, Cape Town, Bordeaux and other important wine regions. The latest generation of winegrowers in Mainz and Rheinhessen can best be described as young, inspired and determined to keep the tradition alive by producing top wines sold all over the world. 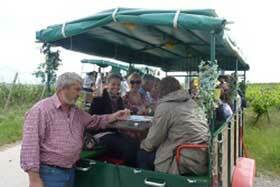 Discover the beautiful land of Rheinhessen in all its facets. To complete this trip, you need a coach. We would be delighted to arrange one for you. The Upper Middle Rhine Valley with its castles and palaces is one of the most charming landscapes in Germany and a UNESCO World Heritage Site. Explore its beauty from a helicopter, sweeping down over the Rhine and its historic landmarks and towns, or just hovering to taken in breath-taking views. For centuries, the Rhine near Ginsheim was known for its boat mills. Up to 21 such floating mills were in operation until they were swept away by the Industrial Revolution and increase navigation on the Rhine. Visit the fully restored, last working boat mill anchored in the river.